2017 Perishables TradeNumbers - WorldCity, Inc. Check out our Facebook Photo Album from the Trade Connections Perishables TradeNumbers release event. WorldCity and USTradeNumbers.com, released its annual Perishables TradeNumbers publication Friday as part of its Trade Connections event series. 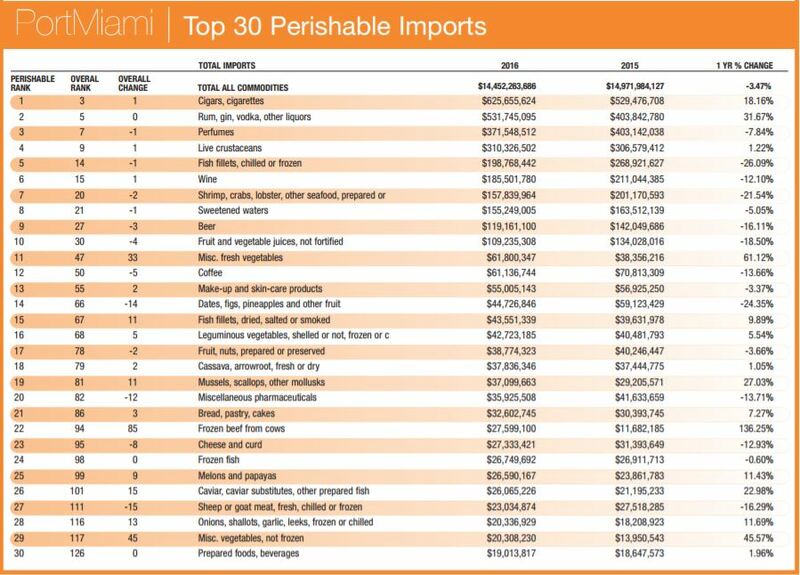 PortMiami, Miami International Airport and Port Everglades saw mixed results from 2016 trade in products making up the perishables sector. 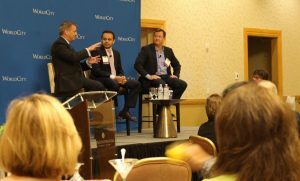 Let’s analyze the statistics before a couple major takeaways from a panel discussion led by SeaLand CEO Craig Mygatt, Brinks Global Services Director of Life Sciences Leandro Moreira and Amerijet Vice President of Strategic Initiatives Derry Huff. Whiskey, vodka and other liquors exported from Miami increased by more than 45 percent to become the third largest PortMiami perishables export. Chicken exports also increased dramatically, up almost 37 percent. 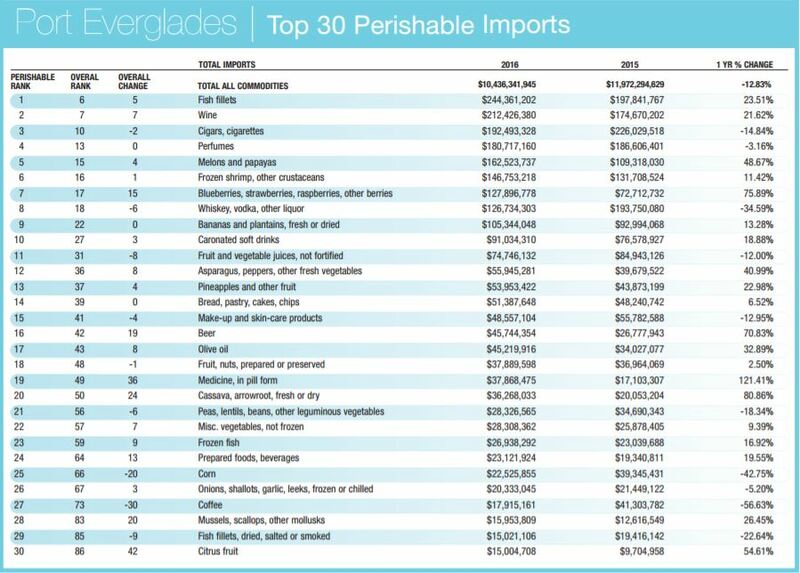 The largest one-year increase outside the top-10 PortMiami perishables exports was plants for pharmacy/perfume/insecticides was up almost 67 percent in 2016. Cigars and cigarettes increased 18 percent and was the top PortMiami perishables import. 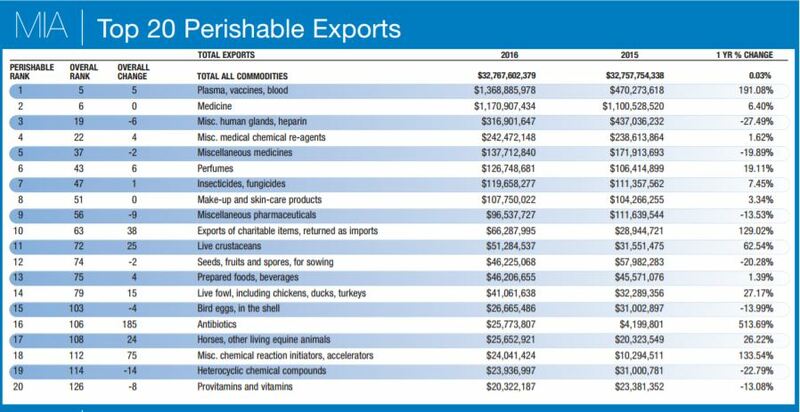 Welcome to a major pharma hub, with plasma, other blood fractions and vaccines being the largest MIA perishables export, up 191.08 percent from the previous year. The top perishables import saw a whopping one-year increase of 1,183 percent to take the top spot, heterocyclic chemical compounds, often used in the pharmaceutical industry. 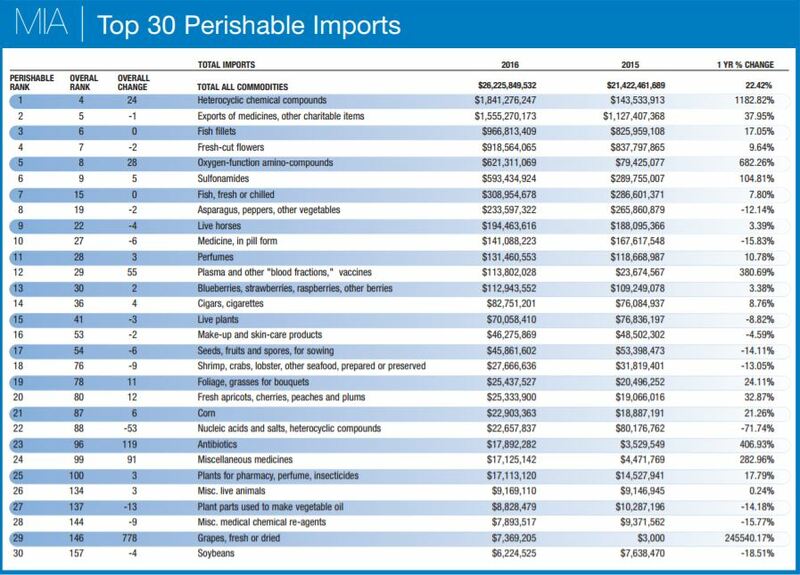 Six other perishables imports were up more than 100 percent into MIA: oxygen-function amino-compounds, sulfonamides, plasma and other blood fractions and vaccines, antibiotics, plants for pharmacy/perfume/insecticides, and grapes (up to $7.37 million from just $3,000 the year prior). 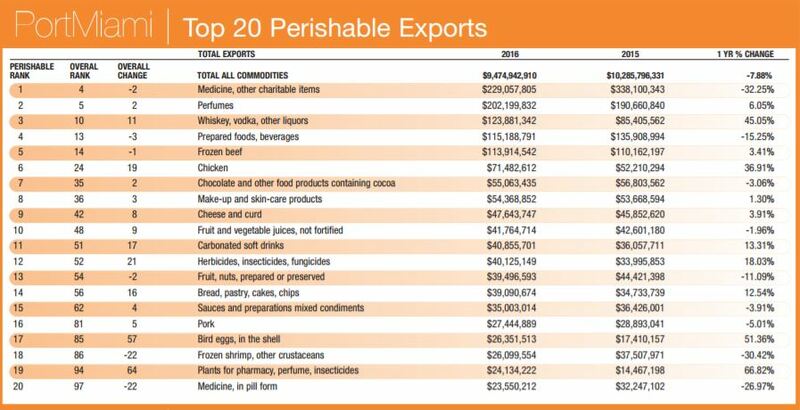 Prepared foods and beverages edged out perfumes for the top perishables export from here, up almost 20 percent. Charitable donations, including pharmaceuticals, saw the largest year-to-year change, up more than 130 percent. 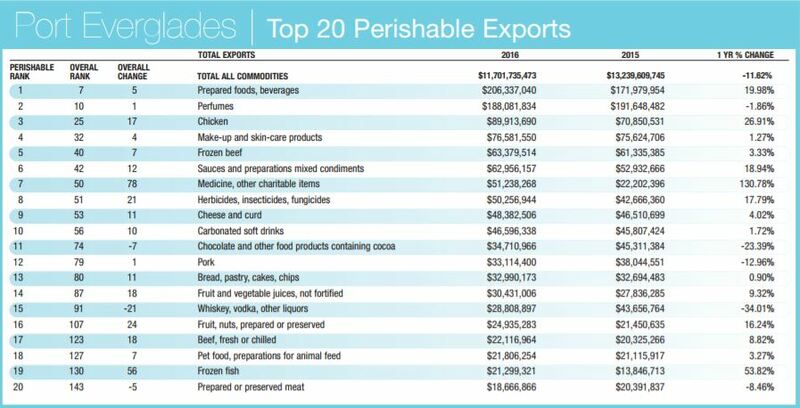 Each of the top-2 perishables imports were up more than 20 percent from the previous year, fish fillets and wine. Medicine in pill form saw the largest increase, up more than 120 percent. As you can see from the tables above, pharmaceuticals are growing in and out of Miami. A big part of that is a recent designation earned by Amerijet from the International Air Transport Association called the Center of Excellence for Independent Validators in Pharmaceutical Logistics (CEIV Pharma). MIA was the first U.S. airport to become CEIV Pharma designated and joins Brussels, Belgium as the only two now with that distinction. Ernesto Rodriguez, chief aviation marketing officer at MIA, asked the panel what percentage of perishables containers do not make it through the supply chain due to regulators. “That doesn’t happen very often,” said Mygatt, who went on to say less than two percent of shipments to the United States east coast get rejected. “The USDA goes way down channel,” said Huff, applauding how that regulatory agency is doing a good job being present near the origin of the supply chain and verifying proper handling of perishable products. 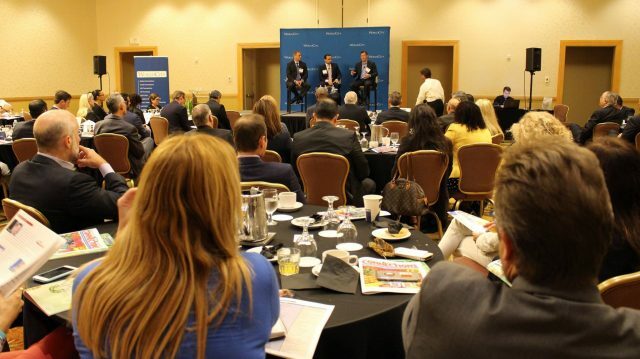 On September 15, World City’s Global Connections series continues with our fourth annual healthcare forum. Be sure to attend the next Trade Connections as well on October 20, the third annual National Export-Import Forum.